The BFST® Side Shoulder Wrap is designed to heal soft tissue injuries in the side of the shoulder. This includes Rotator Cuff injuries, Upper Bicep Tendinitis, Deltoid injuries, and repetitive strain injuries. Muscle, tendon and ligament injuries can all be healed quickly and effectively with a BFST® Side Shoulder Wrap. The Side Shoulder Wrap comes with the Energy Web® already inserted inside the wrap. Both the Wrap and the Energy Web® are specially designed for the shape of the side of the shoulder. This unique design ensures the best treatment and coverage possible. The Side Shoulder Wrap covers your deltoid, rotator cuff and the upper portion of your bicep, to ensure you get an even distribution of healing energy over your entire injury. We have two different Shoulder Wraps that target two different areas. While this page is dedicated to the Side Shoulder Wrap, we also have a Top Shoulder Wrap. Generally speaking, if you have a Deltoid injury or Upper Bicep Tendinitis, you should use the Side Shoulder products. If you happen to have a Supraspinatus or Infraspinatus injury, or a case of Frozen Shoulder, you should use the Top Shoulder products. It all depends on what area you need to target. Rotator Cuff injuries are a little more tricky, as it depends on which part of the Rotator Cuff is injured. Pay attention to where the pain is. Is it closer to the "side" or the "top"? Use the coverage zone image above to determine if the Side Shoulder Wrap would cover the painful area. The Side Shoulder Wrap comes with 3 Extension Straps that allow you to customize the fit of the wrap. This makes it easy to find the perfect fit for your unique body shape. Some people won't need much extenson, while some people will need more, which is why we include a Small Strap, a Medium Strap and a Large Strap with every Side Shoulder Wrap. Blood Flow Stimulation Therapy (BFST®) treatments promote blood flow to the area of your injury, deep below the skin. 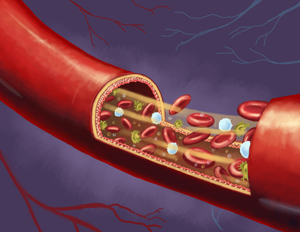 This increase in blood flow is exactly what your damaged tissues need to heal properly and completely. The BFST® Wrap is designed to be used while you're at rest. Put it on, plug it in, sit back and relax. People often notice a slight tingling sensation and warmth deep in their shoulder as the BFST® starts increasing their blood flow. The effects of each 20 minute treatment last for 4 hours or more, so it's best to spread your treatments out over the course of the day. For optimal results, do 3-4 treatments per day. An ideal treatment regimen would be one treatment first thing in the morning, a treatment in the afternoon, another treatment in the evening, and the last treatment of the day right before bed. Wear your BFST® Wrap loosely during treatment. You should be able to fit two fingers between the wrap and your shoulder during treatment. When you're not receiving treatment, unplug the power cord from the Energy Web® and tighten the wrap to your body. 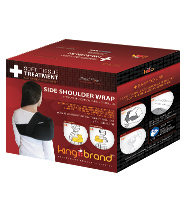 This will provide your injured shoulder with light support and protection between treatments. The cord disconnects right at the wrap so you are free to move around, using the wrap as a soft, comfortable brace with no cords attached. Don't start using BFST® until all of your swelling and inflammation is gone. If you are experiencing swelling and/or inflammation, we recommend that you use our ColdCure® Side Shoulder Wrap. ColdCure® treatments help reduce the pain, swelling and inflammation associated with soft tissue injuries and chronic conditions. BFST® Wraps come with a 1 Year Manufacturer's Product Quality Warranty. Please feel free to contact us any time if you have any questions regarding our products.